This breathtaking, completely remodeled 2-bedroom + den villa has both a lake front and gulf front view. Professionally designed with a new model home quality and flowing open floorpan design, Perfect for entertaining guests or a peacefully relaxing day. This villa is unlike anything else in Prestancia. 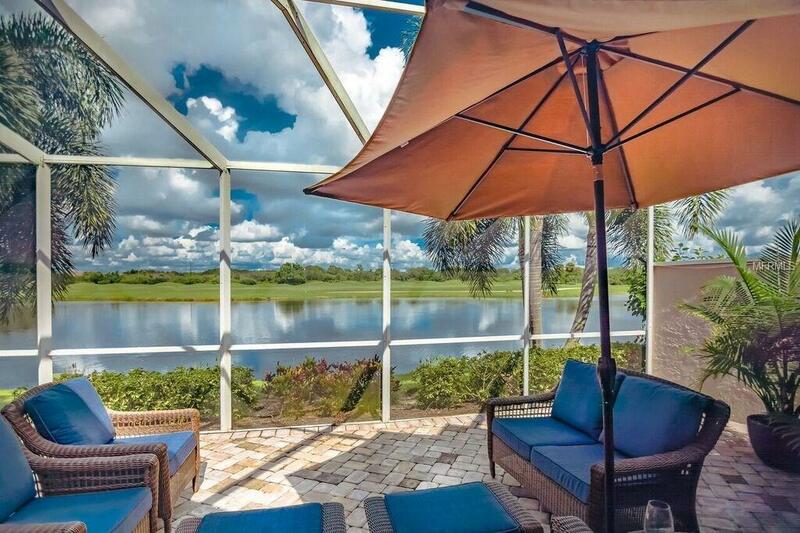 The home features attractive wide plank porcelain tile flooring, an open great room leading to the outdoor living space with unobstructed views of the TPC golf course and lake. The remodeled kitchen is bright and airy with luxury finishes, including quartz counter tops, glass fixtures, backsplash accents, stainless alliances and and an abundance of contemporary cabinets. All the windows have been replaced with Impact hurricane-resistant glass providing enhanced safety, security and makes the villa very peaceful and quiet. Mara Villa is a small enclave of villa homes within Prestancia a beautifully landscaped, award winning golf community. Located near the countries number one ranked beach Siesta key and some of Floridas best cultural attractions. This villas is a must see and move in ready! Pet Restrictions 2 Dogs Or 2 Cats Or 1 Of Each. No Pets For Tenants.